The Georgian features of the Apex Waterloo Place building make it both a timeless and elegant hotel. Built in 1819, it’s the first purpose-built hotel in Edinburgh and although the contemporary furnishings now reflect the modern traveller, its character is still one of the most distinguishing features. 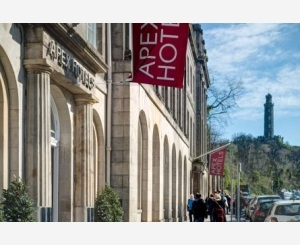 At the east end of Princes Street, this hotel stands in the desirable New Town location just moments from Calton Hill, George Street and Waverley Train Station making it central and convenient. But the central location is just the beginning. A warm and friendly welcome is guaranteed from a team who are genuinely interested in your stay and ready to ensure it’s personalised to your needs. From the comfortable and well-equipped bedrooms to the stylish restaurant and bar, the hotel goes beyond the basics of a city centre base. Each of our stylish rooms and suites is outfitted with stylish linens, 42-inch LCD TVs with satellite channels, complimentary Wi-Fi and, in some cases, luxurious robes and slippers. Bathrooms are large, with walk-in showers and Elemis toiletries. 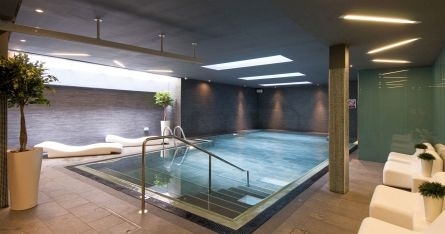 The swimming pool and gym are complimentary and treatments by PURE Spa & Beauty can be added to enhance a relaxing stay. For business, the conference and meeting rooms in the hotel provide hubs to meet, eat and relax in the city centre. We’ve been awarded a Certificate of Excellence again in 2017 for the sixth year in a row.